There has been a wave of gorgeously-illustrated and skilfully-written picture books this month. Picture books are often viewed as solely for young audiences, but many are objects of art that can be enjoyed by all ages. Here are six new picture books that can be appreciated by young and old. 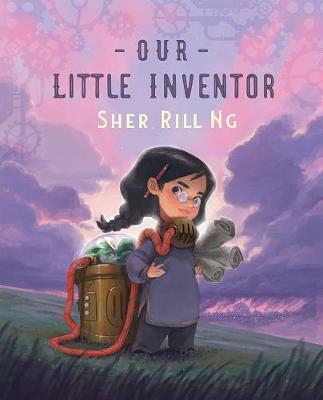 Enter a fantastical steampunk world in Australian author-illustrator Sher Rill Ng’s debut picture book. The tenacious and creative Nell has worked hard on an invention designed to improve air quality and takes it on the long journey to the Big City where it’s needed most. When she arrives, Nell can’t find anyone to take her innovations seriously, and especially not the men in power. Nell returns home, forlorn, but bounces back to produce an even more effective solution. This is an inspiring story of a resilient young girl who pushes through negativity and disregard by holding onto the encouragement and support of others. The immersive visual world created by Ng is cinematic in scope, with a unique blend of cultural influences. For ages 4 and up. The truly beautiful artwork by Johnny Warrkatja Malibirr, the inaugural Kestin Indigenous Illustrator Award winner, and the lyrical prose of renowned author Sally Morgan come together to tell the sweet story of Little Bird as she wakes up and sings with Sun, plays with Cloud, Rain, and Wind, snuggles up with Moon and dreams of flying among the stars. Earthy browns, rusty reds and bright accents of white and yellow conjure up the natural world: crimson flowers, wallabies, goannas, water buffalo, echidnas, turtles, frogs and all manner of birds and trees. The language used is simple and poetic, the perfect demonstration of how pleasurable well-chosen words can be. Little Bird’s Day will appeal to readers aged 3 and up, and all lovers of contemporary Indigenous art. Trim was the adventurous seafaring cat adopted by explorer Matthew Flinders, and this delightful picture book details his adventures with his owner in the late eighteenth and early nineteenth century. Told firmly through Trim’s perspective, we witness daily details such as mouse-catching, fleas, making friends with humans, the joys of good food and rivalries with dogs and other cats, alongside dramatic events such as being thrown overboard, shipwrecks and imprisonment. Seasoned illustrator Smith brings history to life with action-filled illustrations that detail all the areas of the ships, the shape of the heaving seas, the whirlwind cat fights and life on the islands. Tiny ship logos detail the relevant ship name and year: the HMS Reliance, HMS Norfolk, HMS Investigator, HMS Porpoise, and HMS Cumberland. A Cat Called Trim is the perfect balance of narrative and fact, celebrating a cat who valued loyalty, friendship and above all, the pursuit of adventure. For ages 5 and up. This exuberant rhyming picture book is full of thoughtful ways to contribute positively to the lives of others and the wider community. Adelaide Crows AFL footballer Eddie Betts has used his own experiences of racism and challenges with literacy to create Eddie’s Lil' Homies, a cast of characters that demonstrate how to be inclusive, accepting and friendly, invite others to join groups, help people who need it, listen to others, intervene in bullying and be community-minded. The bouncy text is enormous fun to read and the cute cartoon illustrations (done by another footballer Jesse White!) show a diverse range of kids in everyday situations. My Kind is the sort of unique, independent and positive publishing that will make Australia a better place to live. For ages 4 and up. Grandfather is sad. He spent his early years living simply in a mountain village, but now he’s old and lives in a small city apartment with his grandson and the boy’s parents. City life is crowded, noisy, anonymous and far from nature. When the grandson brings home a tiny plant rescued from a crack in the footpath, Grandfather shows no interest. But slowly, over time, Grandfather is drawn into his grandson’s project, and the two work side by side to nurture the first plant, then more, then a whole garden. The joys of nature come back into their world, and then start to spread outwards into their community. Award-winning Australian illustrator Bruce Whatley has a habit of experimenting with different techniques, and in this book he used Photoshop to recreate the look of traditional Chinese woodcuts. This is a heartwarming story of the ability of plants and animals to soothe the soul, to restore hope and life, and to bring people together. For ages 5 and up. Eric Veille has already enchanted us with the odd My Pictures After the Storm and the funny The Lost Dads Home, and now he’s created yet another winner with Encyclopedia of Grannies. Exactly as advertised on the label, this is a loving and silly exploration of the diverse world of grannies. Topics covered include: granny sayings, creases, knitting, flexibility, hair, moods and what’s inside grannies (answer: the granny when she was a little girl). Accompanied by Veille’s bold and quirky drawings, this is a wonderful celebration of the time, energy, care, talents and weirdness that grannies contribute to our lives. For ages 5 and up.